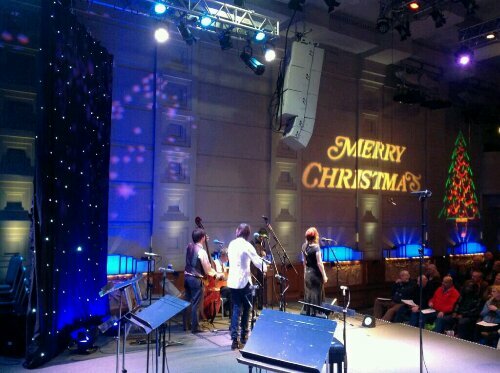 I’m only at work for half a day today as I’m off to that London this afternoon to be in the audience for the live Christmas edition of Radio 3’s In Tune. I first heard the Christmas edition about 5 years ago and ever since I’ve wanted to go. However every year I’ve either not got tickets or have got tickets and not been able to get the time off work. But today I’ve managed it! 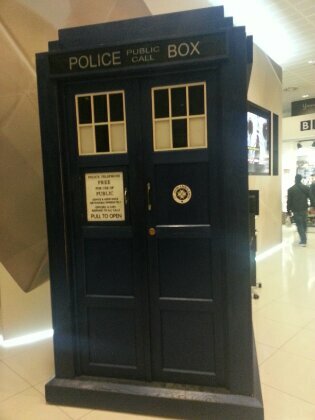 To get in I had to go through security and it was quite ironic that given the fact that there was a Tardis behind the security scanner it was the other Tardis on my keyring that caused the security people to have a second look. 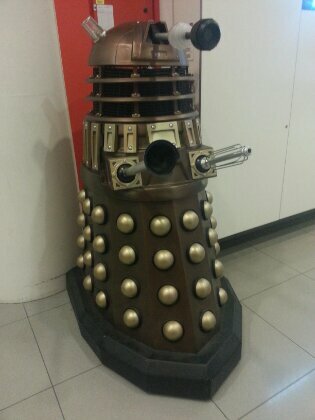 I wasn’t going to argue though as this fellow was standing guard! 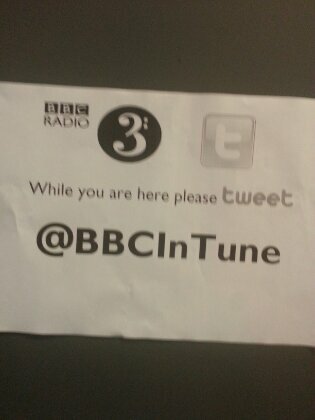 There’s a sign saying please tweet @BBCIntune! Done! How very obedient – wish we’d written buy us mince pies! The waiting area had changed since the last time I was here. Now instead of lots of small rooms there was just one big area with a view over the weather studio. 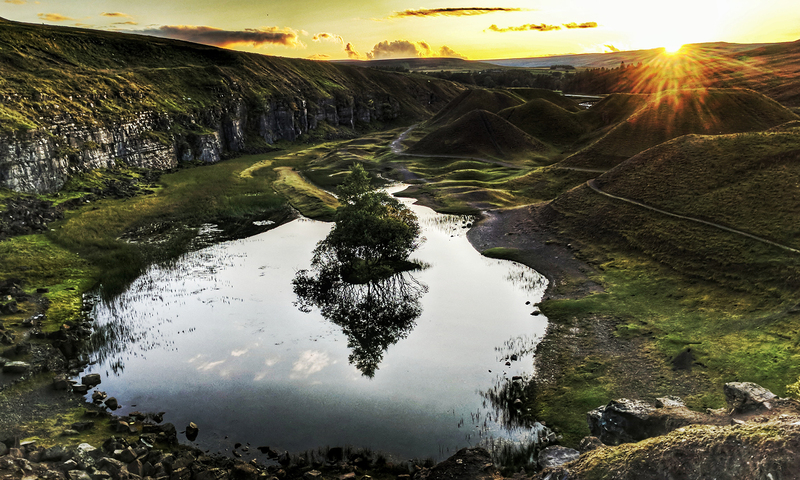 The area was also shared with the BBC tours so sometimes it got a bit confusing and congested. The catering has been outsourced to Costa Coffee so no wine available which was a shame as I could have fancied a glass! 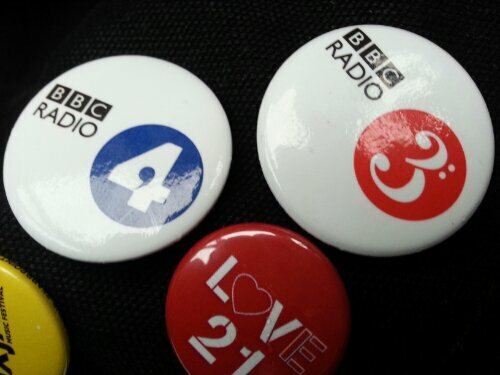 There was also a shop selling quite expensive memorabilia but at least the badges were reasonable at 65p each. At about quarter past four we were all called in to the theatre. As I had got there early my sticker was number 38 so I got to go in quite early and I ended up at the end of the second row. I could tell by the microphone positions which performers were going to be where. The Brabant ensemble were obviously centre stage, jazz group Man Overboard in front of me and pianist Tom Poster on the other side. The show was presented by both Sean Rafferty and Suzy Klien – it was odd seeing Sean as his voice is so familiar and although I’ve seen pictures of him it was odd seeing him in the flesh – as it were! They were wearing headset microphones and it was obvious from the start that there was a problem with Suzy’s and although a technician took here round behind the curtain to get her to hoik her skirt up it to get at the transmitter it continued to give problems throughout the show – nice to know these things happen at the Beeb! 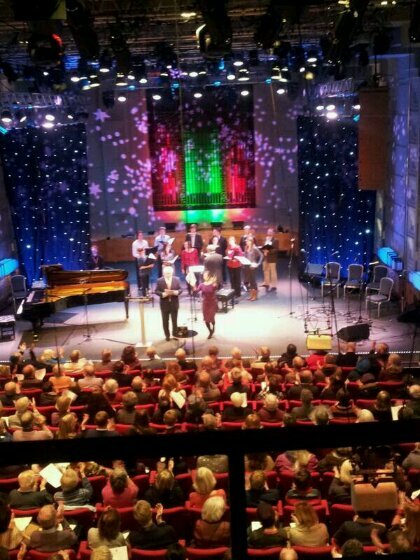 In the middle of there was also a lectern for the readings given this year by Jeremy Paxman. The thing about Paxman, who appeared from the back of the stage when introduced be-suited but with his tie skew whiff, was that he genuinely seemed to be taken aback by the audience. I don’t know if he didn’t know there was going to be an audience or what but it seemed to stop him in his tracks. He said we scared him! But later after his first reading he said we were nice and later still complained that we weren’t getting mince pies! 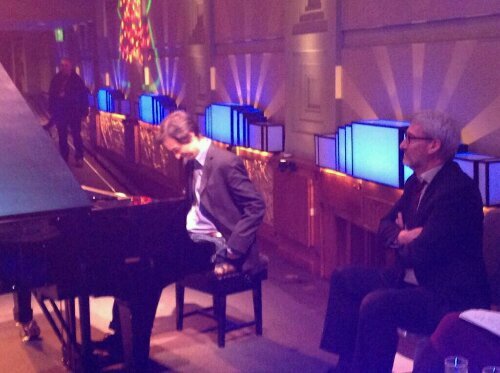 After his first reading he went and sat over by the piano – I saw him as Tom Poster was playing and I got the impression that he’d never sat that close to a professional musician before and he seemed to be absolutely transfixed! Man Overboard were fantastic – loved the music especially the clarinet. I thought the violin played looked familiar though and it turned out that he was Thomas Gould who is the principal violinist with the Aurora Orchestra and had been on the show last time I went! It seemed odd though that he was playing jazz on a violin made in 1782! Actually some of the other members seemed familiar too but that was because I’d seen them outside when I arrived!